"...It is great to see the main stage at The Royal George Theatre back “in business ” again! A beautiful venue with great sight lines and very comfortable seating ( with leg room) that deserves more use. When Hershey Felder was doing a new show every year, this was the home he chose, and based on my knowledge of his works, he only will use a venue that he feels will allow the audience to see all that happens on the stage. 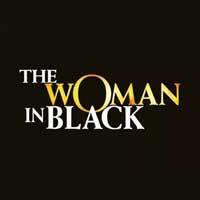 The current production, “The Woman in Black”, as directed by Robin Herford, proves this to be an accurate statement." "...I didn’t actually shriek in fear—at least I hope I didn’t—during “Woman in Black,” but I had my share of gasps, starts, shudders and, during the second act, an embarrassing, adrenaline-induced muscle spasm that ran from knee almost to shoulder. If this is your idea of holiday-time merriment, then by all means see this two-man (plus ghoul) show, a touring version of a production that has run for almost thirty frightening years in London." "...The Woman in Black, a spooky Christmas transplant from the UK, is the second-longest running play on the West End (the top spot belongs to another little potboiler, Agatha Christie’s The Mousetrap). The play has run for over 30 years, and is being staged for the first time in the US by original director Robin Herford, courtesy of PW and Pemberley Productions. I’ll get down to brass tacks, because first and foremost you must be wondering “Is it scary?” The answer is, yes. In fact more so than any play I’ve seen that attempts such an exercise. It would seem that the Brits like their winter solstice served up with some well-earned jumps and screams."